Of course like other bloggers, I enjoy comments on my blog. If you want to participate in this Linky Love Challenge visit Harriet’s Blog. She's already created a very kewl trophy for the '1000 Comments Club' and plans to offer an award to those who reach 500 comments too. 5-24-09 addendum - Harriet's considering repeating the challenge for June ... so if you'd like to participate, drop by her blog and let her know. FYI -I just totaled my comments for the month so far and as of 8pm I've made 985 ... so I've just got 15 to reach the 1000 goal. How kewl is that? Really lovely collage, as always! Beautiful shots! Love those blue skies! It's always exciting to learn new tricks in photo editing that will make us enjoy our photos more. Love your pics...Remind me of San Diego. Your photos of glorious skies are much appreciated! The new collage format is perfect - sometimes things take a long darned time. :) Well worth it - from my standpoint!! Is it clipping mask? I am so slow when it comes to new tech. Good job. The sky collage is very cool! Isn't it great when you can combine a group of photos like that?!? That's what I love most about the sky, it's never the same. Great shots! I loved the shot of the tree in the center. What kind of tree is that?! It's very cool. I always love your Haikus and sky shots. I hope you have a beautiful weekend. I dub thee 'Queen of Collage' !!! Hope to see you at my new place some time. lovin the palms as always ;) .. so your doing harriets comment challenge? i just about have time to catch up on mine hahaha! Beautiful collage. What a lovely place you live in. Beautiful collage. I must learn to do that! I hope you decide to participate in the Brenda Photo Challenge. We'd love to have you! Beautiful shots. I almost missed the sail kite in the first one. You certainly did a fantastic job with your first collage. I have yet to learn how to do that. 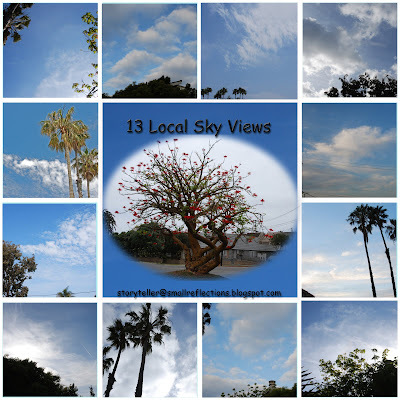 Wonderful collage of sky shots. Hope you're having a great weekend. Great job on the comment challenge. That's a lot of comments. I guess you'll be participating in June also. I will be for sure.